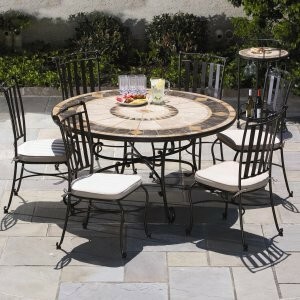 Is your patio or outdoor dining furniture in need of a refresh? Having bought a new kamado BBQ over the winter I got my outdoor dining furniture out this Spring and I have to say it was starting to look a bit tired, so I've started to make a few outdoor home improvements. As I do my research I'm noting down all the things I find out about the different qualities, materials and costs so when you need a new dining set or hammock, all the information you need is right here. The first thing to consider is your climate and how much maintenance you are prepared to do. Generally speaking if your climate is harsh then think about metal construction such as wrought iron or aluminum. Your other option is wicker, teak or mosaic and these materials are more susceptible to the elements and are best brought inside during the off season. You want the size to be in keeping with the amount of space you have available. If you’re blessed with lots of space then go for it but if you’re looking for something on the porch or by the pool then you might want to consider a bistro style patio set. Think about how you’re going to use your outdoor dining furniture. Is it just for the family or are you an entertainer? Most sets come as either five or seven pieces (table plus four or six chairs) which are great for the family but if you want the option to open out then maybe check out what are called “conversion sets” because these will give greater flexibility and the opportunity to add more. Aluminum - Lightweight, doesn’t rust and is pretty much indestructible, an all year round choice provided you don’t live in an area susceptible to wind! Wrought Iron - The other all year round choice. 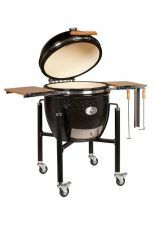 It’s heavier in weight and also rust proof provided that the powder coating isn’t chipped. Very robust and easily cleaned with soapy water. Wicker - Supremely comfy to sit in but not as weather resistant as metal. Look out for furniture that’s vinyl coated aluminum as this will help extend it’s working life. Wood - If treated properly is a good material but look out for the harder woods such as cedar or teak. Teak is the best because it’s really hard and resists warping. 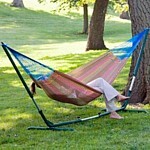 When your smoker is on a long cookout, it's time to relax in your hammock with a nice cold beer. When it comes to buying hammocks there’s one key feature to look for, after that it’s all about what you’re going to use it for and the warmth factor. The single essential feature is the wooden spreader bars that keep it open when you’re in it and also help to spread the weight form the base. The golden rule is to make sure firstly that you’ve got spreader bars and secondly to make sure that they are sufficiently robust because no matter how good the fabric quality is, if the wood isn’t up to it then you’re wasting money. The standard is the rope style with a woven bed made either from cotton or polyester. Polyester is more durable but cotton is more comfortable. A quilted option is more suitable if you live in a cooler climate because the rather than being a woven bed, this is actually two layers of fabric with fibrefill in the middle. A bit like snuggling into a sleeping bag. The poolside option is designed to be quick drying and durable but because of the specific features they tend to be less comfortable than the traditional rope version. How Do You Erect It? The traditional way is to tie it between two trees but unless you have the perfect garden with ideally spaced trees then a stand is probably the best way to go. Whichever, you can buy robust hanging straps and clips to make sure that your construction is safe. The only other differentiating factor is where it is made. You’ll see examples such as Mayan, Nigaraguan etc. Frankly I don’t think there’s too much difference between them but certainly they stand out from the basic rope style because they are hand crafted. Because of the hand crafted construction, the weave is not as tight, this makes it more comfortable but at the same time more easily damaged by a sharp object. There's good and bad things to be said about patio heaters. 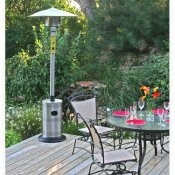 Let's first consider the patio heater pictured here on the left. It doesn’t matter what size of gas bottle you have, this type of patio heater will heat the same amount of space indoors that it can outdoors for Ten Times the length of time. It really is a waste of energy because the vast majority of the heat just goes into the atmosphere. That waste of energy is your waste of money. Are Patio Heaters Harmful To The Environment? The answer has to be yes, after all you're burning a fossil fuel and releasing it into the atmosphere, then again that's only the same as the barbecue. The only difference is that heat source is so you can eat whereas the other is to keep you comfortable but does that make it right or wrong? Does that make them good or bad? In context probably not as bad as we were perhaps all thinking. 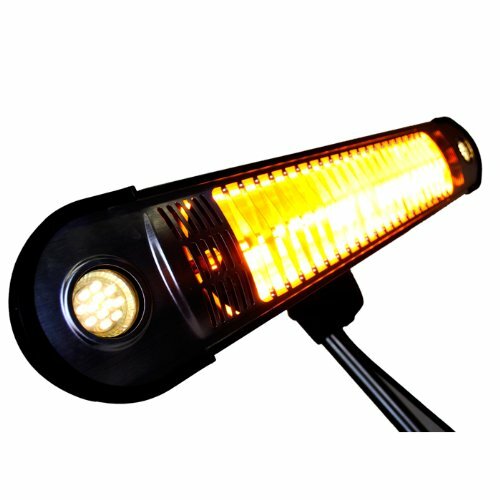 That said, if you are going to buy a patio heater, make sure it is an electric infra red patio heater. These heaters are different because rather than just randomly heating the atmosphere these dudes direct its heat directly to where the heater is pointing. Heat is also magnified and focused by a parabolic reflector behind the heater element so there is virtually no wasted heat. Then again, if you're a bit cold, pull on an extra layer and move a bit closer to the barbecue.